A goitre is an enlarged thyroid gland. Goitres are a common feature of many diseases of the thyroid. It is estimated that around 2000 million people suffer from iodine deficiency. Iodine is essential in the synthesis of thyroxine. If iodine is lacking then the thyroid is unable to generate adequate quantities of thyroxine. This stimulates the pituitary gland to release more TSH in order to induce the thyroid gland to produce more thyroxine. The thyroid gland responds by undergoing hyperplasia and thus forms a goitre. Multinodular goitre is more common in women than men. The cause is uncertain. The thyroid gland features nodules of benign thyroid tissue that are separate by bands of fibrosis. The nodules often contain very large, dilated follicles that contain large quantities of colloid. Cystic change can be seen. 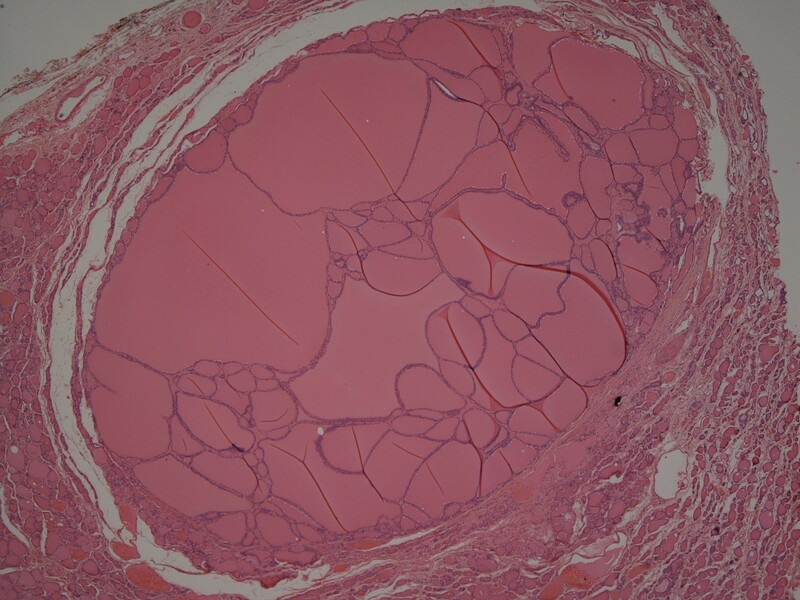 Histology of a multinodular goitre that shows a fibrous band separating two nodules. 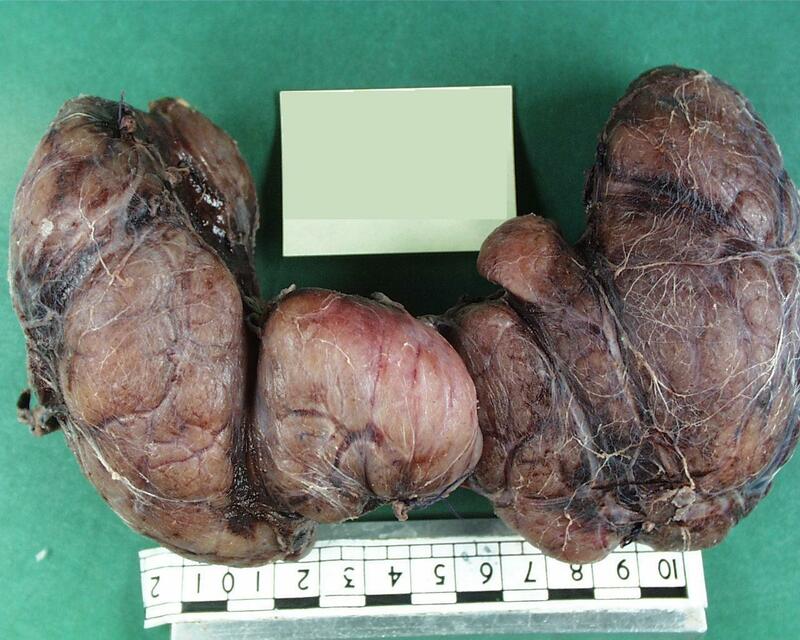 This nodule within a goitre contains dilated follicles. The main symptom produced by a goitre is simply the presence of a lump in the neck. Occasionally a goitre can impinge on the oesophagus to yield dysphagia and rarely the trachea may be compressed. Large goitres can extend into the thorax and are known as retrosternal goitres. These goitres are more likely to induce compression-related symptoms. 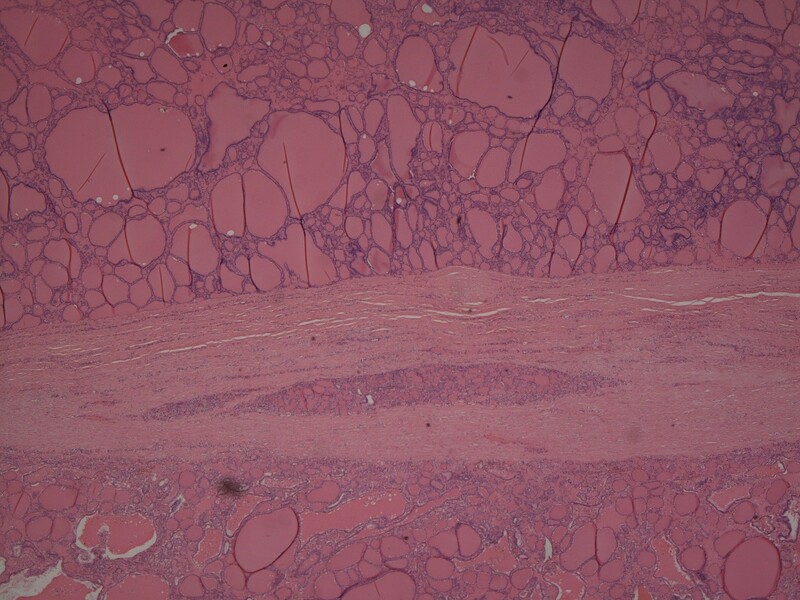 Occasionally multinodular goitres produce hyperthyroidism.